I started suffering from acne when I was 13. I hated it with a passion because it added to my geekiness: glasses,braces,and now acne. I didn’t really talk about it and it upset me when my dumb brothers noticed it. My mom told me to use alcohol to dry it out and I washed my face with Dove soap,then spot treated with alcohol. The alcohol dried up the acne and left my skin feeling tight,so I ditched it. I thought the acne would cease once puberty was over. It did except on my forehead. Whenever I was stressed or it was that time of the month,my forehead went crazy. I had enough so I decided to start doing a trial and error with different products. I started with some unknown brand and it gave me headaches and dizzy spells. Then I found Aveeno. I trusted it for my eczema, so why not for my face. I started using Aveeno Positively Radiant foam cleanser and its moisturizer. It worked! Of course I didn’t see results right away,but after about a month,the acne started disappearing and my skin tone evened out. The ugly duckling was turning into a swan! I’ve been using it for six years now. However,I did build a regimen recently. Since I have been trying to be natural with my hair care,why not skin care too? In the morning, I wash my face with either Aveeno foam cleanser or Clearasil Acne Wash &Face Mask. I do the mask once a week for a minute. I sometimes add a couple drops of tea tree oil because of its anti bacterial,antiviral,and antifungal properties. You can also add a few drops to your moisturizer. Don’t apply directly to your face because its very potent and can irritate skin. I use an exfoliator scrub once a week to clear away dead skin cells. My current brand of choice is Neutrogena Naturals Exfoliating Acne Scrub. 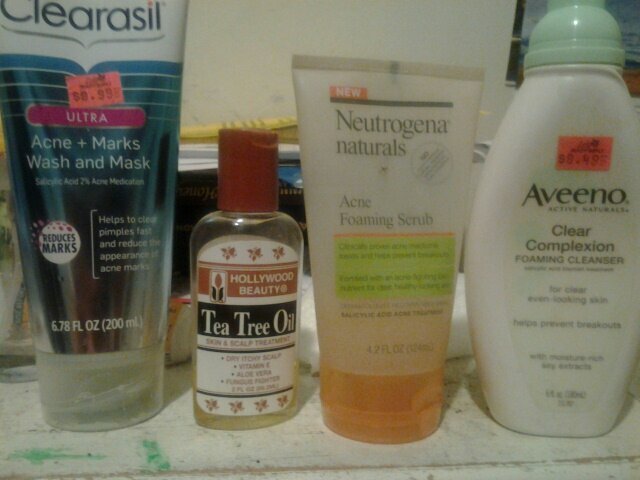 It doubles as a acne fighter so when I don’t use my Clearasil,I’m still treating my acne. After washing my face,I moisturize. I LOVE and REFUSE to leave Aveeno Positively Radiant Moisturizer. I’ve been using it for years because it has a broad spectrum SPF of 15,so I’m good in summer& winter. Yes ladies, u need sun protection in the winter! I’m hoping to use more products in the Neutrogena Naturals line. It’s another way of using things that are more natural just as I try to do with my hair. Try Baby Lips sunscreem lip balm to have some added protection to those lips! So,ladies, what products are you using to take care of you fierce face?